The widespread introduction of computing technologies into the office workplace has transformed the modern offices of today promoting agile working. The availability of equipment that no longer need to be used sitting at a desk in a dedicated office (such as laptops, tablet computers and internet-capable smartphones) has resulted in radical development, posing a challenge regarding where and how that equipment is used, removing the constraints of the conventional office environment and thereby paving the way for novel ergonomic office designs. Evidence suggests that these changes in technology and working practices still present risks to health and safety; however, the nature of these risks (both physical and psychosocial) and the requirements for managing them are gradually changing. Researchers have attempted the “syntactic theory , based on principle of “pattern syntax  in reaching the target from different perspectives. Hence, this approach has been applied in the current study to achieve the study objectives. Keeping pace with advancing technologies and protecting the office workforce from hazards of work-related musculoskeletal disorders (WRMSDs) caused by unergonomic ways of working with the abovementioned equipment, there is a dire need to explore cost-effective as well as innovative intervention options for safe working. Although there is a high interest regarding improving workplace conditions, there are very few longitudinal field trials that focus on the ergonomic interventions for individual health of staff and productivity. This further justifies the need to undertake this extremely relevant research. At present, MSDs is one of the most important problems ergonomists have been encountering in workplaces around the world., In many countries, prevention of WRMSDs has been considered a national priority., Published scientific reports and papers show that the incidence of MSDs among computer users is much more than that in other occupations. Poor postures have been found to be associated with decreased performance efficiency due to body discomfort resulting from restricted postures. More suitable working postures may have a positive effect on workers' musculoskeletal systems and may allow effective control of work performance and reduction in the number of occupational injuries. Awkward and constrained postures result in musculoskeletal stress on different body regions of seated workers, and are a major factor in the development of MSDs., In India, WRMSDs tops the list of occupational health morbidities' and very few studies have been undertaken to explore the most effective ergonomic interventions to reduce WRMSDs and injuries. The study involved participation of employees who were directly engaged in office work using visual display terminals from different countries covering Sri Lanka(730), Malaysia(450) and Singapore(850) of one multinational corporation. Intent of the study was to give a global perspective of office ergonomics implication through the intervention. Symptom elicitation was based on a subjective feedback from the sampled individuals. A structured pre-tested questionnaire was sent by Medical & Occupational Health teams of the respective countries to all employees to take up an online 13 point questionnaire, based on workplace features (mentioned below), including Nordic Questionnaire—a screening tool for musculoskeletal discomfort shared in local languages on two occasions—baseline and after 3 months (n=2030). This questionnaire was extremely simple and took approximately 6 to 8 minutes for completion. Regarding consent for participation, the investigators' approached all the participants through formal channels of communication. The questionnaire was based on workplace features like devices used and behavioural factors like work posture, working hours, hours of sitting time, pre-disposing motivational conditions, taking rest-breaks, performing desk stretches & employee flexibility in re-organizing their workstations on their choices & preferences. It also included non-modifiable risk factors like age and gender difference. After sending the online questionnaires to employees of the same MNC offices at Singapore, Sri Lanka, and Malaysia, 65, 92, and 83 responses (n = 240) were received, respectively. After completing the questionnaire, employees were trained on correct postures and office ergonomics with animation graphics (intervention). The animation graphics were programmed to initially show incorrect postures and subsequently the correct postures that need to be maintained during working with computers/laptops and related devices (kindly refer to [Graphic 1],[Graphic 2],[Graphic 3] depicting still photographs of animation graphics). The employees' appreciated the animation graphics and were impressed as it was a “never-before experienced” fun learning. The approximate time taken to view all the animation graphics was 6–8 minutes. As employees appreciated all the animation graphics, they viewed them for longer periods. The same questionnaire was sent again after a gap of 12 weeks to only those employees who responded to the baseline questionnaire on initial assessment. When the questionnaire was re-sent, 2% of the employees could not be followed up due to nonavailability and 17 employees had pre-existing diseases in the form of arthritis of knee joints (n = 5), cervical spondylosis (n = 10), 1 each had rotator cuff injury of the right shoulder joint, and 1 had tenosynovitis of the left thumb and were excluded from the study. Therefore, the results were tabulated for 203 employees (Singapore 58, Sri Lanka 82, and Malaysia 63; n = 203). Placement of monitor screen, keyboard, mouse along with furniture type and related equipment may involve risks as, of the 203 employees who responded, 47.35% had some musculoskeletal symptoms. Among them, 58.7% had lower back pain, 46.9% had upper back pain, 44.1% had wrist pain, 39.5% had shoulder pain, and 37% had knee pain. The percentages are high as some employees had multiple complaints i.e., 2 or 3 complaints. However, only 40% of these employees had ongoing symptoms at the time of evaluation (past 7 days). The current study revealed that, among the employees working for more than 5 years, the prevalence of MSDs was high (65.95%) compared to employees working for less than 5 years (30.91%), P < 0.001 [Table 1]. Employees working for more than 5 years may be more susceptible to injury under high work demands, as wear and tear of the body (especially of joints) along with age is an important individual risk factor inducing MSDs. The current study also revealed that women had more MSDs (62.24%) compared to men (56%). This finding is in accordance with other studies wherein women have been reported as having a higher incidence of MSDs., Women are more often exposed to repetitive biomechanical stresses of the upper limb compared to men. Furthermore, the complex interplay between anthropometrics, work ability, productivity, and pain perception may explain gender differences. Explanations for higher incidence among women can also be found in differences in household work and childcare, work situation, physical, and psychosocial work conditions. A study among 690 Danish computer users revealed that women often report poor work ability and differences in pain perception than men. Hours of work determine the cumulative biomechanical load and degree of fatigue; it can be short and intense, leading to acute disorders, or prolonged with low/moderate intensities, leading to chronic or degenerative disorders. Prolonged sitting posture during Visual Display Units (VDU) work could initiate continuous static contraction of the neck muscles, which may result in muscle overload, resulting in neck pain,, upper limb disorders, and back pain. Moreover, the general health risks of prolonged sitting time are becoming increasingly evident. Large epidemiological studies have shown that the total sitting time is associated with an increased risk of all-cause, cardiovascular and possibly cancer mortality. An increase of all-cause mortality can be noticed around 7–8 hours of self-reported sitting time per day. In the current study, MSD symptoms were higher among employees whose hours of sitting work were 4–7.5 hours (66.25%) compared to other employees whose hours of sitting work were 2–4 hours (47.09%) (P < 0.001), which was significant. When workers are stressed, their muscles are more contracted than normal and cannot relax completely at rest. Stress increases the occurrence and changes the characteristics of MSDs, increases pain, and makes operators more susceptible to other risk factors. A subsequent 3-month evaluation after web-based intervention showed a significant 41–50% decline in ongoing symptoms. This decline was attributable to the following behavior changes observed in the trained employees post-intervention viz., a) approximately 83.7% employees could arrange their workstation ergonomically against 7.1% preintervention; (b) approximately 81.2% employees performed desk stretches against 18.8% preintervention; and (c) approximately 77.8% employees started taking rest breaks against 16.7% preintervention. A striking 97% of the employees reported that animation graphics were educative and motivating [Graphic 1],[Graphic 2],[Graphic 3]. 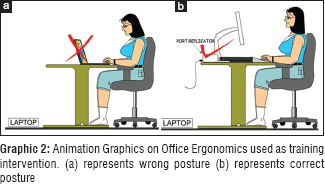 Few simple animation graphics used in the current study (shown above) were programmed to initially show incorrect postures and subsequently correct postures that need to be maintained while working with computers/laptops and related devices, which influenced behavior modification. More than 50% of the respondents belonged to the age group of 18–30 years preintervention and 73% postintervention. Female respondents were also higher in both the groups i.e., 57.6% in preintervention and 55.2% in postintervention. Majority of the participants had been working in the company for 1–10 years and 57.1% spent 4–7.5 h daily in the company. After the intervention, it was observed that there was higher reduction in symptomatology of MSD. Knee pain reduced from 37% to 31%, and lower back pain reduced from 58.7% to 41%. 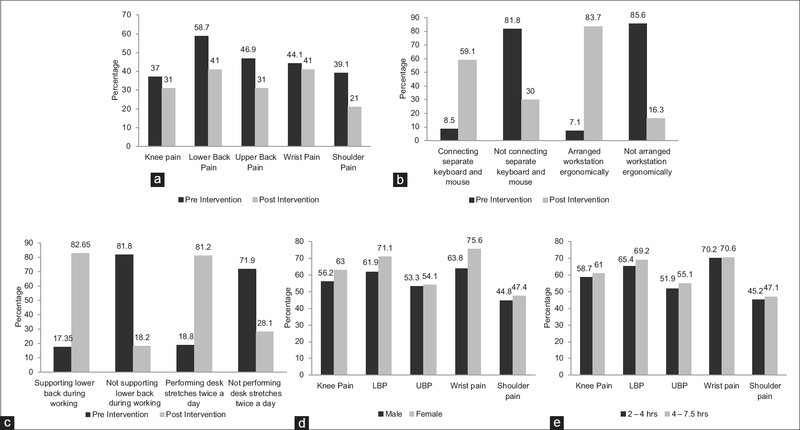 Upper back pain, wrist pain, and shoulder pain also reduced to 15.9%, 3.1%, and 18.1%, respectively [Figure 1]a.
Respondents also changed their habits of connecting separate keyboards and mouse to their laptop. It was also seen that employees also arranged their workstation ergonomically for safe and more comfortable working. 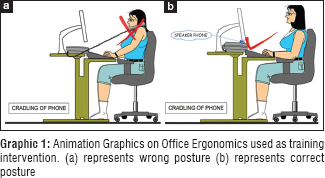 Behavior changes in connecting separate keyboards and mouse increased from 8.5% to 59.1%, arrangement of workstation ergonomically improved from 7.1% to 83.7% (odds ratio = 5.28) [Figure 1]b; [Table 2]. There was a striking improvement in the habit of supporting the lower back during work hours and performing desk stretches twice a day, thereby signifying the usefulness of the study in achieving the study objective. This is evident by the finding that 82.65% participants supported their lower back postintervention compared to 17.35% preintervention. Approximately 81.2% participants performed desk stretches twice a day compared to 18.8% preintervention [Figure 1]c (P < 0.001). It was also observed in the study that female participants were experiencing more MSD than men as there was higher reporting of wrist pain, followed (in order) by low back pain, knee pain, upper back pain, and shoulder pain. The study conducted by van der Ploeg et al. showed similar findings  [Figure 1]d.
Employees spending more time in sitting work reported having more MSDs compared to employees spending less time doing sitting work [Figure 1]e.
A strong relationship between musculoskeletal problems and hours of sitting was observed [Table 3]. Relation between different musculoskeletal problems and the habit of supporting the back during working also had a strong association [Table 4]. Moreover, the habit of connecting separate keyboards and mouse to their laptop and development of musculoskeletal problems was also correlated [Table 2]. All the above were statistically significant findings, as mentioned earlier. In short, results of the current study reveal that the intervention viz., web based online questionnaire and subsequent training with animation graphics, was extremely successful in significantly influencing behavior modification towards proactive and practical office ergonomics. The employees appreciated animation graphics and admired the training that was imparted. They agreed to become trainers (TTT)/ambassadors to influence behavior modification among their colleagues on maintaining ideal work postures, ergonomic arrangement of workstations, optimizing chair functions, as well as performing desk stretches, thereby promoting safer working. As the above results are highly gratifying, the web-based KAP evaluation appears to be an excellent, cost-effective technique based on the principle of “pattern syntax” and syntactic theory that brings about desired behavior change in ideal work-posture maintenance. For sustainable behavior modification, this training activity could be repeated at 6-month intervals with short, intermittent reminders for safe working. Hence, we conclude that newer technology using web-based animation graphics is highly effective to create office ergonomics awareness and has the potential to become a best practice (because of its ready acceptance among employees) in countries where language is a communication barrier and an onsite visit may not be feasible in the current scenario of budgetary constraints globally. Moravcsik EA. An Introduction to Syntactic Theory. Bloomsbury Publishing; 2006. I-Language : An Introduction to Linguistic as Cognitive Science. Second Edition. Daniela Isac and Charles Reiss. Oxford University Press, 2nd Edition, 2013. Brewer S, Van Eerd D, Amick BC 3rd, Irvin E, Daum KM, Gerr F, et al. Workplace interventions to prevent musculoskeletal and visual symptoms and disorders among computer users: A systematic review. J Occup Rehabil 2006;16:325-58. Li G, Haslegrave CM, Corlett EN. Factors affecting posture for machine sewing tasks: The need for changes in sewing machine design. Appl Ergon 1995;26:35-46. De Wall M, van Riel MP, Snijders CJ, van Wingerden JP. The effect on sitting posture of a desk with a 10° inclination for reading and writing. Ergonomics 1991;34:575-84. Wahlström J. Ergonomics, musculoskeletal disorders and computer work. Occup Med 2005;55;168-76. Das B, Sengupta AK. Industrial workstation design: A systematic ergonomics approach. Appl Ergon 1996;27:157-63. NRC, National Research Council/National. Work-Related Musculoskeletal Disorders. Academy Press; 1999. Mattila M, Vilkki M. OWAS Methods. In: Karwowski W, Marras WS, editors. The Occupational Ergonomics Handbook. CRC Press LLC: USA; 1999. p. 447-59. Li G, Buckle P. Current techniques for assessing physical exposure to work-related musculoskeletal risks, with emphasis on posture-based methods. 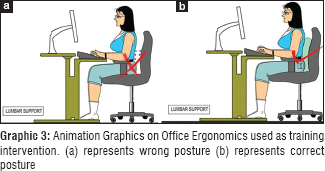 Ergonomics 1999;42:674-95. Paquet VL, Punnett L, Buchholz B. Validity of fixed-interval observations for postural assessment in construction work. Appl Ergon 2001;32:215-24. Jaiswal A, Patro BK, Pandav CS. Occupational Health and Safety. Role of academic institutions. Indian J Occup Environ Med 2006:10:97-101. Habibi E, Soury S. The effect of three ergonomics interventions on body posture and musculoskeletal disorders among stuff of Isfahan Province Gas Company. J Edu Health Promot 2015;4:65. Van Wely P. Design and disease. Appl Ergon 1970;1:262-9. Madeleine P, Vangsgaard S, Andersen J, Ge H, Arendt-Nielsen L. Computer work and self-reported variables on anthropometrics, computer usage, work ability, productivity, pain, and physical activity. BMC Musculoskelet Disord 2013;14:226.
van der Ploeg HP, Møller SV, Hannerz H, van der Beek AJ, Holtermann A. Temporal changes in occupational sitting time in the Danish workforce and associations with all-cause mortality: Results from the Danish work environment cohort study. Int J Behav Nutr Phys Act 2015;12:71.